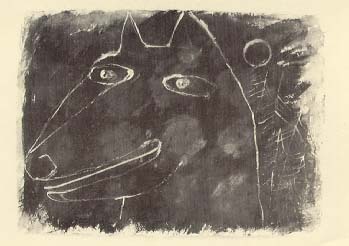 I have a funny pencil drawing of another dog that Jan did hanging in my living room; it's been making me grin every morning for years. It's not to everyone's taste, but Jan thought art should be in-your-face and evoke some emotion, cause a conversation, make you think. i've always wished i was rich enough to have a house with a HUGE wall, and ask Jan to make me a bigger-than-life canvas, some bold statement.